Oggi è il primo giorno di Maggio ed io l'ho trascorso al mare. Non appena tornata a casa, ho fatto la doccia e sono andata al centro commerciale. Volevo indossare un outfit comodo, ma allo stesso tempo ricercato. 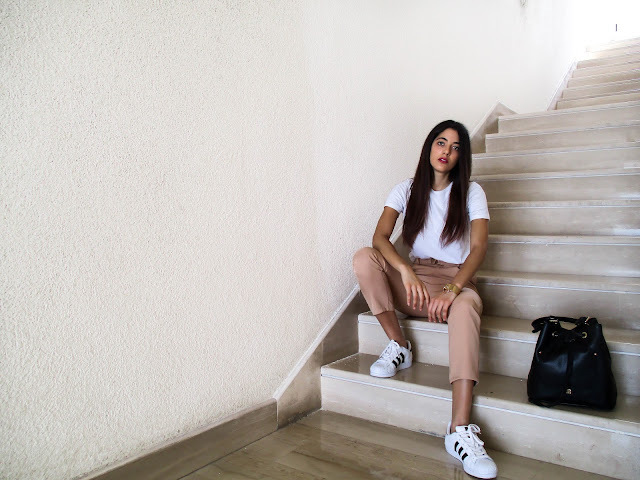 Ho scelto questo pantalone rosa a vita alta, t-shirt bianca, sneakers bianche, una borsa secchiello nera e un bracciale dorato. Voi cosa avete fatto oggi? Today is the first day of May and I spent it at the seaside. As soon as I got home, I took a shower and went to the mall. I wanted to wear a comfortable outfit, but at the same time sought after. I chose this pink pants to high, white t-shirt waist, white sneakers, a black bucket bag and a golden bracelet. What did you do today?